The Manhattan Helmet Fair and Bike Rodeo is an annual event that takes place in Manhattan, Kansas. Children 15 and younger with an adult will receive a free helmet (while supplies last) and custom fitting. Children can also bring their own helmet to receive a custom fitting. In addition to free helmets and fittings, there will also be bike inspections, a bike rodeo, and safety stations where children and parents can learn about the rules of the road, booster seat and car safety, and bike and water safety. 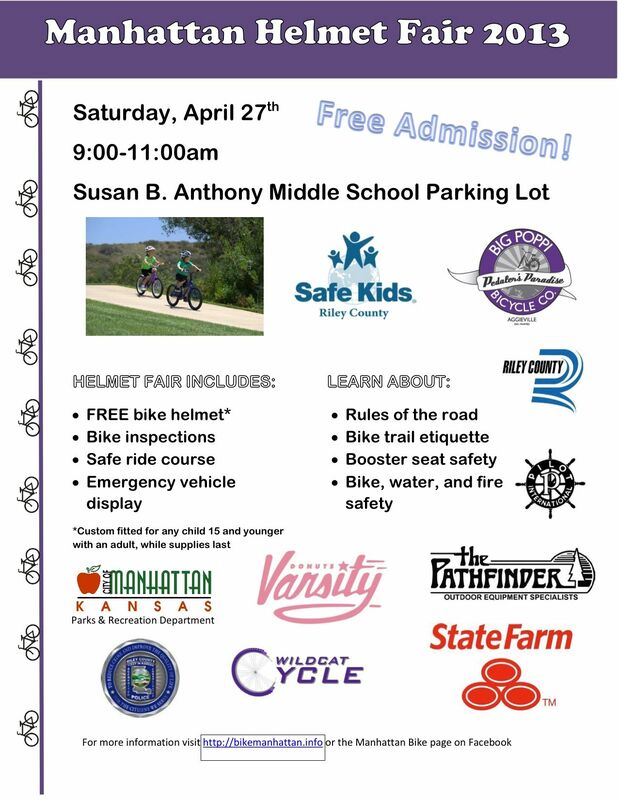 The Manhattan Helmet Fair and Bike Rodeo takes place in the Anthony Middle School parking lot from 9-11am. 04-27-2013 Manhattan Helmet Fair - An annual event that takes place in Manhattan, Kansas, which teaches basic bicycle safety techniques. Free helmets for ages 15 and younger, while supplies last.